Pramod Mahajan's son, Rahul (26), was admitted in a serious condition to Apollo Hospital here while the late BJP leader's secretary Bibek Biman Moitra (38) died of suspected poisoning after a mysterious late night party in which “strangers” were believed to have been present. Exactly a month after Pramod Mahajan's death, Rahul is in a serious but stable condition in the ICU. 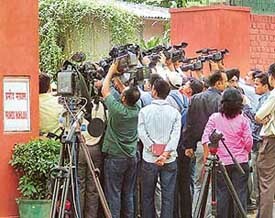 Mediapersons outside the residence of the late Pramod Mahajan at 7 Safdarjang Road in New Delhi after Rahul Mahajan was admitted to Apollo Hospital on Friday. Can judicial intervention sort out the quota row? Rahul Mahajan is on a ventilator in the intensive care unit of Indraprastha Apollo Hospital. The hospital authorities said his toxicology report, expected tomorrow, would help them know whether Rahul had poisoning. They said Rahul would be under observation for the next 72 hours. The Delhi Police is working overtime to narrow down on the three persons, which would indicate whether the death of Moitra and the hospitalisation of Rahul Mahajan was a part of a conspiracy. Senior police officials said once they had the CFSL report on the nature of the white powder that was recovered from the victims, it would be clear whether it was mixed with the Champagne. The late BJP leader Pramod Mahajan’s son, Rahul Mahajan, was to carry the ashes of his father to Assam via Kolkata today for immersion in the Brahmaputra. According to party sources, Vivek Moitra, who died on his way to hospital, had spoken to BJP media convener Siddarth Nath Singh last night and discussed with him the schedule and arrangements to be made for the media coverage in Assam. In a ground-breaking judgment, the Punjab and Haryana High Court has refused the plea of a Malaysian citizen for grant of custody of his two children, whom, he had alleged, his wife had “illegally brought to India”. Four members of a family involved in illegal manufacturing and sale of firecrackers died when the stockpile in their house in Hatan village, about 15 km from here, exploded in the afternoon. Income tax assessees who have been saving tax by hiding their income would now find it difficult as the government has decided to replace the one-page Saral form with a four-page form to trace undisclosed income of taxpayers. India and Pakistan today explored bilateral cooperation in a wide range of areas like arts and culture, ayurvedic and Unani medicine, media, archaeology and education, but stopped short of making specific announcements.